George miller directs Tom Hardy, Charlize Theron and Nicholas Hoult in Mad Max: Fury Road. 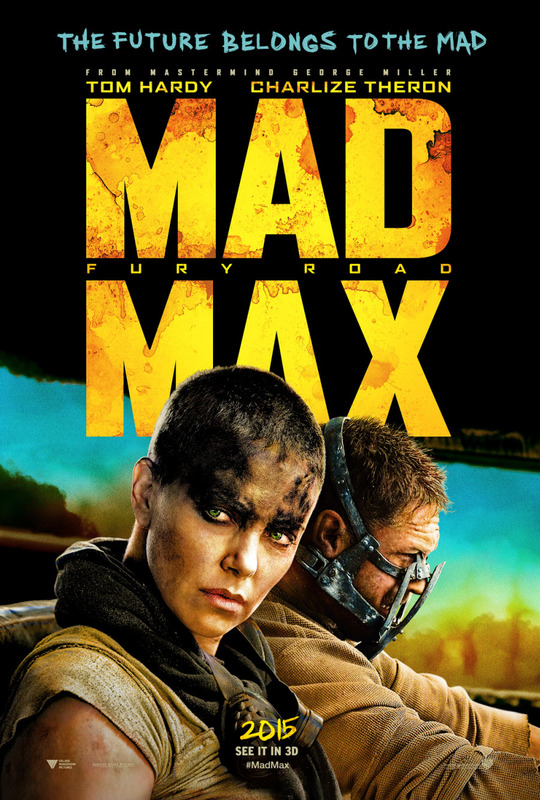 Reinventing the series he first directed over 30 years ago with Mel Gibson as the titular Max Rokatansky, Miller turns up the adrenaline to maximum as Hardy and Theron battle for their lives and their belief in this post-apocalyptic wasteland. Fury Road is less about Max and more about Theron’s Imperator Furiosa and her escape from the clutches of the evil Immortan Joe who lords over Citadel, a Cliffside community (for the lack of better words). Max who we are introduced to in the opening scene gives us the necessary backstory to those new to the series (like me) and you are led on a crazy chase across what appears to be a cross between the Saharan desert and the bottom of the Grand Canyon. He is captured and brought to citadel where is used as a blood bank for the pale skinned war-boys, Immortan Joe’s army. Here we are introduced to Nicholas Hoult as Nux who is so wrapped up in the mythology as concocted by Immortan Joe that he believes that he is destined for paradise when he crosses the gates of Valhalla when he martyrs himself for Joe. Other notable mentions from the cast include Rosie Hutington Whiteley and Riley Keough whose introduction is quite memorable to say the least. I could elaborate on who they are and what part they play in the story but that would be giving away way too much. Suffice to say that they are the key to the whole story. This movie is intensely insane – in a good way. For instance when Immortan Joe commandeers his army to go on a chase after Furiosa they do so armed with a marching band of sort! But since this is mad max this is no ordinary marching band – there are 4 tribal drummers and a masked hanging flame-throwing guitarist. The effect is simultaneously ridiculous and awesome. Most apocalyptic movies tend to drain the color out of the scenery to imply the inhospitable conditions but Miller and DoP John Seale turn each frame of the vast wasteland into a work of art. The high contrast high octane morning chase sequences are a burnished orange and the night sequences an eerie blue. The shots of Theron and Hardy in close up reveal not only the hardship that life in this hellish-earth entails but also reflects the inner light that burns bright in these two brave souls. Several wide-panning shots had me gasp involuntarily marveling at their stark beauty. Every frame is memorable and the visuals are second to none. The production design and the design of the vehicles is a work of mad genius. 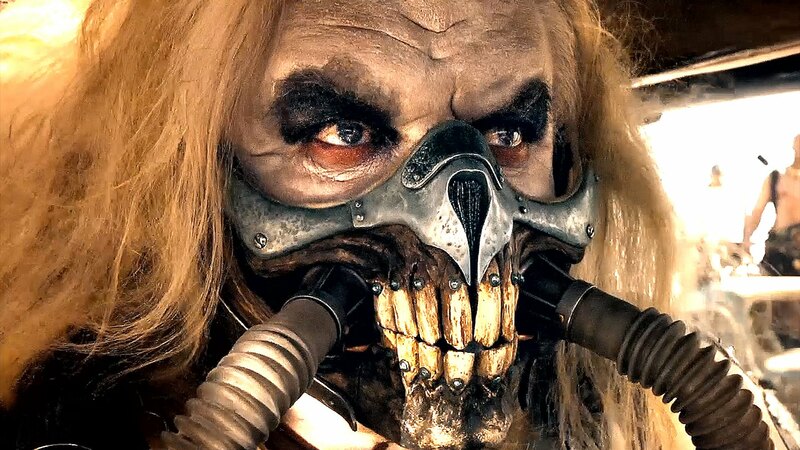 The makeup and costume is one of the most impactful, especially the work that must have gone into making Hugh Keays-Byrne into Immortan Joe, the few times his visage is visible straight on it has such an impact that the feeling is a mix of awe and disgust. The practical effects that went into all the action sequences are mind blowing and can walk circles around any of the CGI Bayhem or any from the avenger’s multiverse. While this is an out and out adrenaline fest this movie has an underlying structural narrative which takes on themes varying from cult-worship to feminism. This is a movie that gave me a buzz that I can last recall having felt in the opening sequences of TDKR and Gravity but both those buzzes faded out after the opening sequences were over, here the opening sequence as crazy as it is , is tame as compared to what comes later on. This may not be the movie for everyone but anyone willing to watch or unsure whether to see it or not make sure you rush to the biggest screen there is to soak in the madness. Consider me a convert! I cannot wait for what Max encounters next. This entry was posted in movie, movies, reviews and tagged action, cannes, charlize theron, explosion, feminism, fury road, immortan joe, madmax, max max, movie review, nicholas hoult, oil, riley keough, rosie hutington whiteley, slavery, tom hardy, war rig, water, zoe kravitz by ViralVora. Bookmark the permalink.